The suspect flag on the database "otomax" is already reset. There are 834 rows in 8 pages for object "sys.sysrowsetcolumns". There are 120 rows in 1 pages for object "sys.sysrowsets". There are 131 rows in 2 pages for object "sysallocunits". There are 2 rows in 1 pages for object "sys.sysfiles1". There are 834 rows in 10 pages for object "sys.syshobtcolumns". There are 120 rows in 1 pages for object "sys.syshobts". There are 0 rows in 0 pages for object "sys.sysftinds". There are 131 rows in 1 pages for object "sys.sysserefs". There are 14 rows in 1 pages for object "sys.sysowners". There are 120 rows in 1 pages for object "sys.sysprivs". There are 166 rows in 4 pages for object "sys.sysschobjs". There are 663 rows in 12 pages for object "sys.syscolpars". There are 1 rows in 1 pages for object "sys.sysnsobjs". There are 0 rows in 0 pages for object "sys.syscerts". There are 1 rows in 1 pages for object "sys.sysxprops". There are 27 rows in 1 pages for object "sys.sysscalartypes". There are 0 rows in 0 pages for object "sys.systypedsubobjs". There are 332 rows in 6 pages for object "sys.sysidxstats". There are 465 rows in 3 pages for object "sys.sysiscols". There are 23 rows in 1 pages for object "sys.sysbinobjs". There are 393 rows in 118 pages for object "sys.sysobjvalues". There are 14 rows in 1 pages for object "sys.sysclsobjs". There are 0 rows in 0 pages for object "sys.sysrowsetrefs". There are 0 rows in 0 pages for object "sys.sysremsvcbinds". There are 0 rows in 0 pages for object "sys.sysxmitqueue". There are 1 rows in 1 pages for object "sys.sysrts". There are 0 rows in 0 pages for object "sys.sysconvgroup". There are 0 rows in 0 pages for object "sys.sysdesend". There are 0 rows in 0 pages for object "sys.sysdercv". There are 157 rows in 1 pages for object "sys.syssingleobjrefs". There are 105 rows in 1 pages for object "sys.sysmultiobjrefs". There are 2 rows in 1 pages for object "sys.sysdbfiles". There are 0 rows in 0 pages for object "sys.sysguidrefs". There are 91 rows in 1 pages for object "sys.sysqnames". There are 93 rows in 1 pages for object "sys.sysxmlcomponent". There are 97 rows in 1 pages for object "sys.sysxmlfacet". There are 17 rows in 1 pages for object "sys.sysxmlplacement". There are 0 rows in 0 pages for object "sys.sysobjkeycrypts". There are 0 rows in 0 pages for object "sys.sysbinsubobjs". There are 124 rows in 2 pages for object "jawaban". There are 1794961 rows in 45225 pages for object "transaksi". There are 3054402 rows in 33120 pages for object "mutasi". There are 210 rows in 3 pages for object "parameter". There are 765 rows in 4 pages for object "pengirim". There are 129 rows in 1 pages for object "produk". There are 2 rows in 1 pages for object "sms_sender". There are 15 rows in 1 pages for object "operator". There are 6880967 rows in 127211 pages for object "inbox". There are 33 rows in 1 pages for object "terminal". There are 63 rows in 1 pages for object "biaya". There are 24463 rows in 138 pages for object "tiket_deposit". There are 24693 rows in 386 pages for object "data_bank". There are 20 rows in 1 pages for object "level". There are 172 rows in 1 pages for object "komisi". There are 1 rows in 1 pages for object "hlr". There are 82605 rows in 1239 pages for object "log_sistem". There are 19 rows in 1 pages for object "sms_center". There are 144 rows in 1 pages for object "produk_level". There are 7238473 rows in 169880 pages for object "outbox". There are 268 rows in 6 pages for object "parsing". There are 41 rows in 1 pages for object "modul". There are 392 rows in 7 pages for object "reseller". There are 60 rows in 1 pages for object "fisik". There are 14 rows in 1 pages for object "auto_respon". CHECKDB found 0 allocation errors and 0 consistency errors in database 'Otomax'. kok ada error nya ya??? 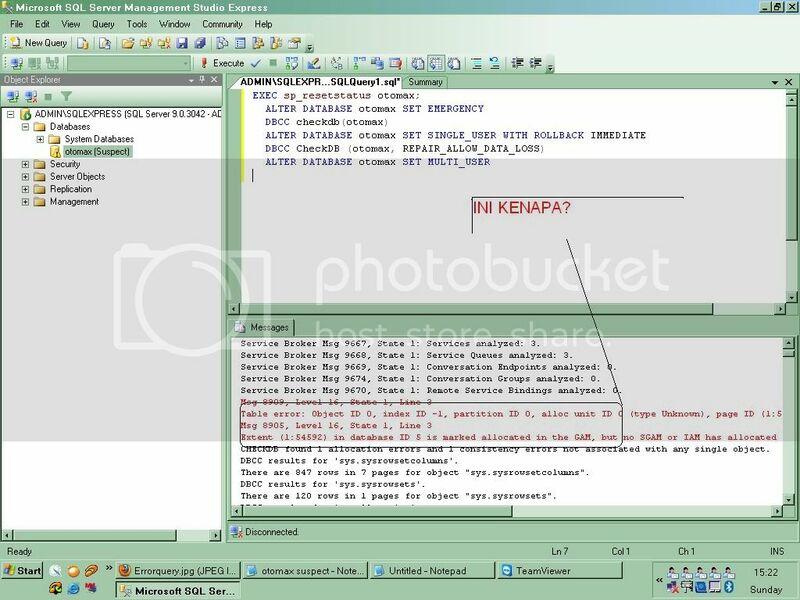 new bie mw blajar dulu sama all big boss..
You should keep one thing in mind while using the above queries that the repair mode used here , REPAIR_ALLOW_DATA_LOSS, is a one way operation i.e. once the database is repaired all the actions performed by these queries can’t be undone. There is no way to go back to the previous state of the database. So as a precautionary step you should take backup of your database before executing above mentioned queries.